While the references above are to the bill numbers in the originating chamber, all of the bills were passed by both chambers and signed into law by the governor. AAUW of North Carolina opposed all the bills. 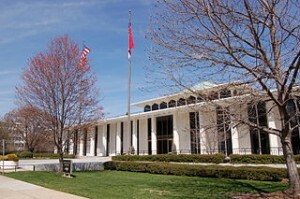 HB944 – Opportunity Scholarship Act (vouchers) – sponsors have a “minus” indicating that AAUW NC opposed the bill. Note that SB402 (the budget) included an implementation of vouchers similar to what was proposed in this bill. HB603 – Equal Pay Act – sponsors have a “plus” indicating AAUW NC supported the bill. This bill’s proposals were not implemented in the 2013 session. We see this document as a report to our members following from our efforts to track AAUW priorities in the 2013 legislative session and discussions at the fall regional meetings where members highlighted the bills that they thought should be included in the voting record. This is a graph of the distribution of the scores showing that more than half of the members of each chamber cast all six consiered votes in opposition to the AAUW NC position. This depends, of course, on the specific bills we chose, and we could have seeded the voting record with bills where there was broad agreement in both chambers, but we feel the document is more useful as it stands, describing a polarization that was evident to our members as they selected bills to include in the guide. AAUW of North Carolina releases this report with, in particular, a strong concern over the attacks on public education embedded in the budget. We urge the legislature to reconsider the decisions made in 2013 and mitigate the effects in the 2014 short session. and to share its findings in voter education efforts.